I have seen so many cute Valentine's day cupcakes, cakes, cookies and more at the grocery stores and on the web. Nice to look at and has me into Valentine's mood but not so good for my waist line! I have been indulging in some cute and sweet foods lately. 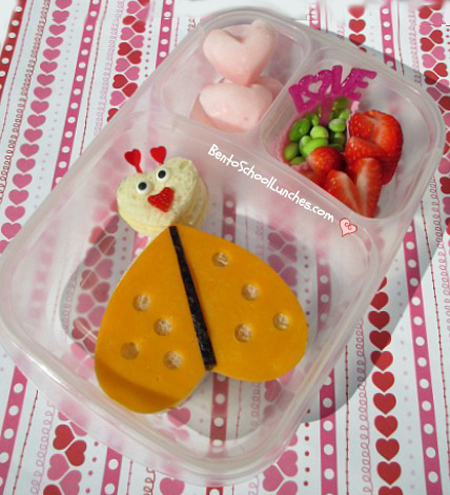 This ladybug bento is very easy, all you need are several heart shaped cookie cutters. Ladybug shaped sandwich that I used two different shaped cookie cutters for the head and body. Icing eyes and a mini heart shaped cutter for the mouth. Body accent is made from colby chesse, I made several holes on the body with a straw and nori (seaweed) in the middle. Antennae are from couple of cupcake picks. Frozen heart shaped yogurt. I froze them in a heart shaped mold that we purchased from Ikea. It will probably melt by lunch time. Awwww love the little ladybug!